Imagine getting soaked in sun on the white silky sands and enjoying the pristine beach view! Andaman Tours Packages offer an exciting and exhilarating tour of the marvelous Ross Island which showcases the architectural splendor of the past. The Andaman Tours Packages also enlightens the tourists with a visit to Cellular Jail in Port Blair informing about the lives of the freedom fighters of India. With a transparent boat ride giving the tourists a stunning view of the colorful corals, Andaman Tours Packages is a bundle of surprises. The adventurous water sporting activities like water-skiing and swimming through the blue oceans and feeling the marine animals at your feet can be memorable. This archaeology of 572 islands, Andaman is worth a watch. Arrive at Port Blair either by flight or ship in the morning. Transfer to hotel selected. Visit Corbyn’s Cove Beach after lunch. 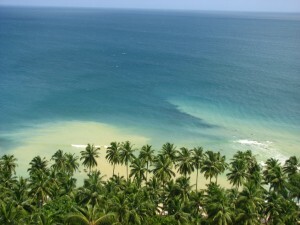 This lovely palm fringed beach is 9 kms from Port Blair and is ideal for swimming and sun-basking. The beach visit is followed by a leisure Harbour Cruise that takes you to the Viper Island. A major attraction here is the gallows atop a hillock. After breakfast, take a full-day tour of places around Port Blair. City tour includes Forest Museum, Mini Zoo, Cellular Jail, Chatam Saw Mill (one of the oldest & largest mills in Asia), Anthropological Museum, Fisheries (Marine) Museum, Naval Marine Museum (Samudrika), Science Centre, Andaman Water Sports Complex and the Cottage Industries Emporium (Sagarika). You can also shop for souvenirs here. After the breakfast enjoy a full-day tour to the North Bay or Coral Island. The place is good to view coral reefs, ornamental fishes and other water animals. A glass bottom boat ride is available to have a close look at the coral colonies. You can indulge in snorkeling, swimming and trekking too. In the evening, view the Sound and Light Show held at the Cellular Jail, which showcases the story of the Indian Freedom Struggle. 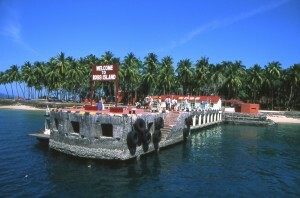 Visit Ross Island after breakfast – this is where the British ruled the islands during the pre-independence era. The island abounds in deer and bird population and is ideal for taking leisure walks. A trip to Chidiya Tapu or Bird Island (31 kms from port Blair) after lunch is next on the schedule. Densely covered with mangroves, the island has imposing greenery and a beach that offers mesmerizing views of the sunset. Transfer to Airport or Harbour for return journey. If you have not decided yet or wants to customize tour itinerary or hotels listed above in "5 Days Andaman Adventure Tour Package from Travel Guru Rs.5889/-", then we can change the travel itinerary and make a personalized, tailor-made holiday package, especially for you. We can modify this travel package as per your itinerary, budget, duration and the tourist places you would like to visit, including transportation and airfare should be included or not. Please fill the form below to contact us.